Rev. Winner carried by jubilant athletes. 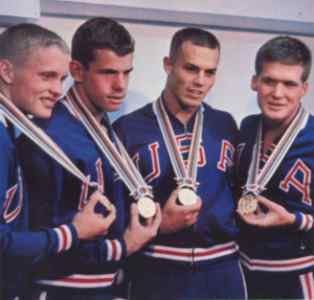 Medals were designed by. Mr. Toshitaka Koshiba, Art Officer of the Japanese Mint, after the models of medals of Amsterdam IX Olympiad (1928). 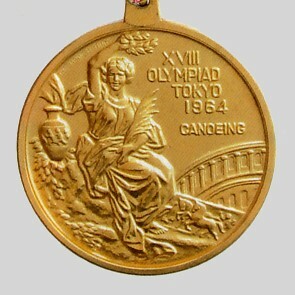 On the reverse side of the medals are the letters of "XVIII OLYMPIAD TOKYO 1964" with the game designation in English of each of the 20 sports (e.g. ATHLETICS). Medals were of 60 mm in diameter and 3 mm thick. 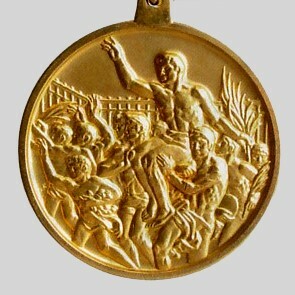 The gold medal is a pure silver mould strongly gilded with 6 grams of fine gold, the silver medal is made of pure silver, and the bronze medal is of bronze. 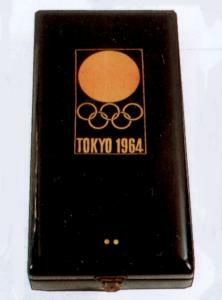 The medals were provided with a ring plated with gold, silver or copper respectively, and a coloured box coated with Japanese black lacquer. The medals were cast at the Japanese Mint. Some of the surplus medals were presented to public museums and for exhibition purposes, while the remainder were melted down.